Parking at Khan Market has been free for 60 years, but the Environment Pollution Control Authority is fighting to install priced parking systems around New Delhi's hot-spots. Photo by Tico. In an attempt to alleviate the city’s congestion problems, starting June 30, New Delhi is implementing its first automated parking lots, The Economic Times reports. The initial two sites for the program will be Sarojini Nagar and Baba Kharak Singh Marg, both are areas famous for street shopping. Bhure Lal, a member of the Environment Pollution Control Authority (EPCA), the governing body responsible for initiating the new parking lots, feels there should be stricter measures to discourage surface parking. “We feel surface parking should not be allowed and if someone parks there, the charges should be Rs. 100 (US $2.23) for two hours,” Lal said. EPCA’s original intention was to keep parking costs at Rs. 50 (US $1.11) to discourage patrons from driving to the market, The Hindu reports. Currently parking rates are not yet decided, but officials estimate the price to be Rs. 20 (US $0.45) for the first hour and 10 rupees for every additional hour. The cost of constructing these parking lots is estimated at Rs. 80 crore (US $18 million) and Rs. 100 crore (US $22 million). 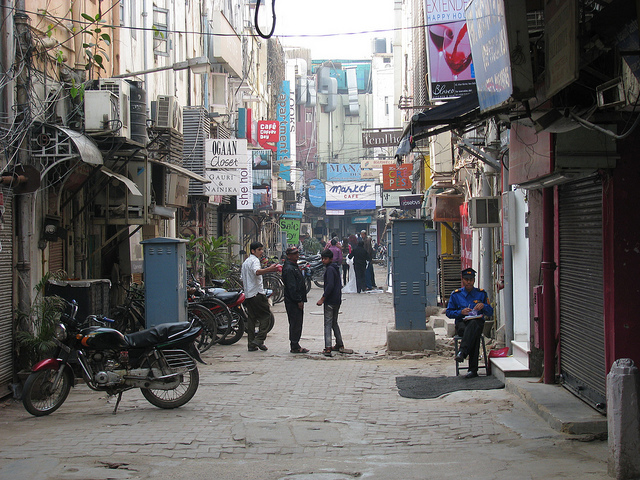 The Trader’s Association for Khan Market, the most expensive shopping market in New Delhi, rejected a similar priced parking lot proposal for its region in order to maintain sales and avoid discouraging shoppers from coming to the market. The Association argues that NDMC’s decision is discriminatory as there are various areas in the council’s zones that still maintain free parking. The Association is also concerned that priced parking would attract parking mafias, News One reports. Anumita Roychowdhury, the Executive Director for Research and Advocacy at the Centre for Science and Environment argues that parking fees near congested areas like Khan Market are crucial to the improvement of air quality in the city. She also asserts that preventing parking rates only serves New Delhi’s privileged few. “Most bus users pay more in daily fares than cars pay for parking in most parts of Delhi,” Roychowdhury contends. Roychowdhury explains that parked cars have taken over 10 percent of available urban land, almost equal to the green areas of Delhi, and with 60 years of free parking at Khan Market, she argues that urban public space is threatened. Roychowdhury’s biggest concern and frustration, however, is policy-makers’ agreement on the importance of full-cost parking and yet, their failure to implement them. Most recently the Delhi High Court ruled in favor of the Khan Market Trader’s Association and upheld the free parking, even if temporarily. Whether Khan Market will get its priced parking lots is unclear, nevertheless, we are sure keen on observing New Delhi’s improvements based on the new parking system.